One word crops up again and again when describing two-piece instrumental group Bicurious: confused. One adjective shows up in every biography, from Instagram to Breaking Tunes, that attempts to describe Bicurious: confused. Even the portrait of a man’s contorted face that adorns the cover art of the band’s invigorating latest single “I Don’t Do Drugs, I Just Sweat a Lot” looks exceedingly confused. Surprisingly, guitarist Taran Plouzané and drummer Gavin Purcell are the mathematical contrary to confused. Their tracks, though often erratic and never formulaic, are comprised of inventive melodies and challenging rhythms that seem to have a mind of their own, seamlessly weaving their way through different time signatures, tempos and keys, but always knowing where it’ll end up, as if the band have them on a leash, but a loose one at that. “Gavin started calling us confused at the start of the band. I think it’s derived from the whole bicurious thing, not knowing what you want from growing up, from men or women, or whatever. We started using it on social media and it caught on”, says Plouzané while sipping a pint outside of Abbey St’s Gin Palace. We raise our voices for the microphone so that the passing Luas doesn’t drown out the interview – passerbyers are certainly confused by our exchange, and I suggest that it may be the listener that is confused by Bicurious rather than the band themselves. Perhaps the music itself is confused, following no familiar structures or forms. Their track “Sugar Beats” even features a sampled voice repeatedly uttering “I’m so confused”. “That’s the nature of it I suppose, it can definitely be confusing at times for all involved”, Purcell agrees. The band have just now finished their Irish tour celebrating the release of “I Don’t Do Drugs, I Just Sweat a Lot”, and before this have been touring Britain and Plouzané’s native France, where the band have felt very much at home. “We’ve been received quite well abroad… grunge seems to really resonate with French audiences but our sound did too, and we’ve always been looked after so well. A bar owner once gave us his apartment for the night we were playing there and kept the bar open for us all night, free of charge”, says Plouzané. The pair smile nostalgically. It turns out that Plouzané fell asleep on the counter of the bar, the videos of which ended up part of their tour vlogs. Purcell affirms that touring is not always comfortable though: “We were sleeping in a squat once, and I woke up to a rat nibbling on my ear.” Plouzané is quick to interject, reassuring me that there was a “beware the rats” sign. Luckily, Purcell didn’t contract the Black Death and disappoint the band’s many loyal fans – their last EP was completely crowdsourced. “We literally had no money so we did a promo video with Sean Smith, a friend of ours, and begged for money in a funny way to make us seem less desperate. It turned out people were really supportive and we’re so grateful for that”, says Plouzané. It’s this loyal fan base that enables Bicurious to grow in popularity without a label. All they need is their manager, who they admit is just a really great friend and essentially another member of the band. “Sleep”, the band’s most successful single, has now accumulated over two million listens on Spotify, an amazing feat for any up-and-coming act, never mind one with an eclectic style of music. “We played Hard Working Class Heroes last December, and we got lucky when sitting down with a Spotify rep. He loved “Sleep” and came to our performance to hear it live. It ended up on a really popular alternative playlist, and now we get a good bit of “come to Indiana!” messages on Facebook from randomers – pay for our flights and we’ll play anywhere”, says Plouzané. 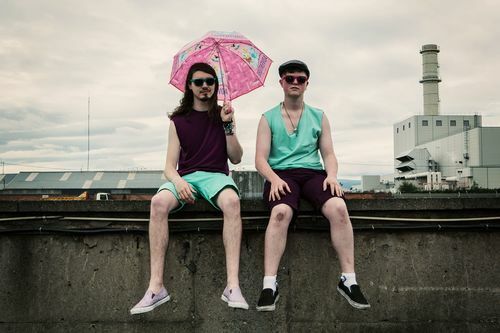 Bicurious are now also the face of the new “An Alternative Éire” Spotify playlist. “It’s become a decent source of income for us – we’re super lucky”, Plouzané explains. Whether they’re playing angrily under Donald Trump’s mock-up echoes of “I am the worst president ever” on “Fake News” or sweating along to their brash and energetic bangers like “Japanese Puppy”, Bicurious have proven that any genre is viable in Ireland’s vibrant underground scene and continue to see their number of fans grow day by day.